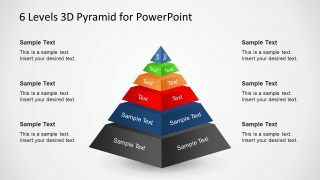 The 6 Levels 3D Pyramid Template for PowerPoint is an innovative diagram design. 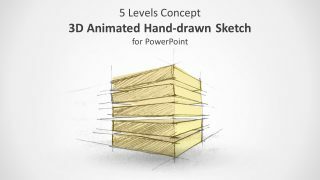 It is a flat vector PowerPoint diagram template providing an enhanced view of the 3D layout. It contains three separate pyramid designs for 6 levels diagrams. 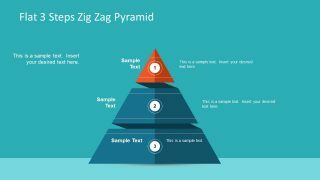 Although, the pyramid diagrams are ideal to present the models organized in a hierarchical format. The segments here show the proportional phases which create logical relation. The organizations can discuss several hierarchal divisions including its functional and work breakdown structure. 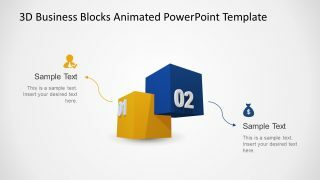 This presentation is a colorful 3D view with the text placeholders on both sides. These placeholders represent each level through their colors. Further, the placeholders have a title and description bars to add headings and keynotes for each phase. And, the diagram also contains textboxes at each level to enter headings. 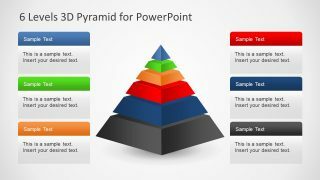 The 6 Levels 3D Pyramid Template for PowerPoint has two slides of segmented diagrams. These are the 3D levels with a gap between them. Whereas, the next two templates illustrate the stacked pyramids. Also, the last slide shows the horizontal layout of 6 pyramids in matching size. 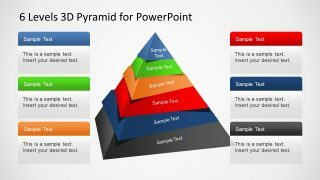 The editable diagram of 6 levels 3D pyramid PowerPoint offers the number of options to customize the design. For example, change the colors from a shape fill option. Each level of the hierarchy pyramid template is a set of flat vectors creating an illusion of 3D shapes. This feature assists the users to create their desire 3D effects by color shading. 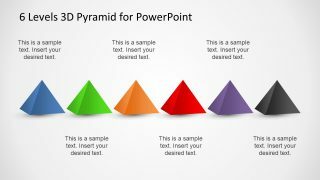 The PowerPoint Pyramid template of 6 levels diagram is a multi-purpose collection of slides. 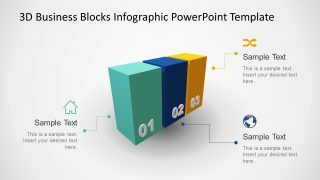 These are the professional looking templates for business and academic presentation. 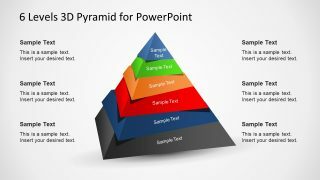 SlideModel has a 5 levels version of this 3D Pyramid Diagram in the premium catalog. The users can copy their desired template to an existing presentation. This way, they can either continue with the theme source formatting or choose to manually edit it.